The old Belmont Station sign has been replaced by a Horse Brass sign (pictured). Finally! The rotating tap menu now lists prices. Hooray! The regular lineup beers have gone up in price by 25 cents. Rats. There was music playing -- country and western -- on speakers throughout the pub. Really? My fish and chips came with a side of ranch dressing instead of tartar sauce. What the...!? For a while I've considered it a drawback that there was practically no way to know the price of a rotating beer at the Horse Brass until your check came. Bravo for printing the prices on the daily menu -- they're even listed online now. We're not in nirvana just yet: the beer I ordered was listed at $4.50 but I was charged $4.95. It's a start. Speaking of prices -- are you sitting comfortably? I'm about to go off on a tangent. 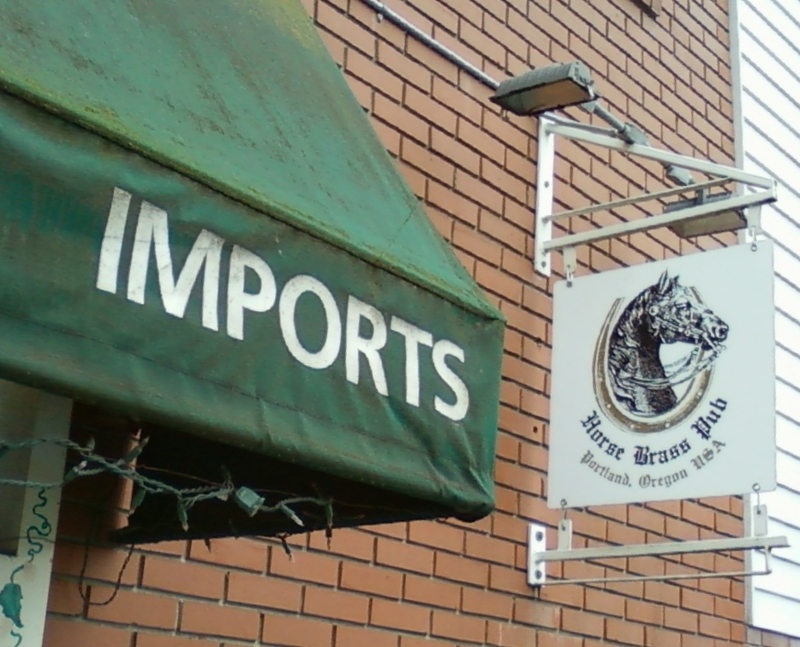 For a few weeks I've been fretting because I realized that the Portland Beer Price Index has been overstating the "typical" pint price at Horse Brass by 50 cents. What happened was, in the fall of 2010 I decided that most of the beers I ordered there were over $5, and only a few were under $5. So, I rather brazenly raised the price I was recording in the PBPI from $4.50 to $5. Problem is, the non-rotating, everyday beers on the menu have still been just $4.50 all that time, so that's the number I should have used, except now they have raised the price to $4.75. This quarter's PBPI will be adjusted properly when it comes out next week. Music playing on the stereo -- that's new, right? I don't recall being in the Horse Brass, even at quiet times, and hearing canned music, or am I just forgetting? Country music seemed a vaguely surprising choice, though the selection sounded more like Americana than Nashville, and it was inobtrusive enough that it didn't bother me. I'll admit I would rather hear that in the background than authentic folk tunes from anywhere in the British Isles. Many's the time that the devil on my left shoulder whispered to me to steal the square Belmont Station sign that hung next to the Horse Brass office awning for many years after the Station had moved up to Stark Street. 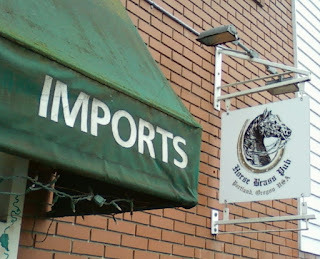 I'm glad that there is now a Horse Brass sign hanging there -- that temptation is now safely behind me. I didn't make a fuss at the time, but ranch dressing with fish and chips? Let's hope that was a one time accident. The music has been around for as long as I can remember, just at such a quiet volume that the crowd noise usually drowned it out. As for your sauce conundrum, did you ask your server about it? I'm guessing somebody probably got your tartar sauce on the side of their salad, and nobody was happy. Thanks Gordo. I figured the music was just something I'd missed. Is it always C&W? I can't imagine Top 40 in there. I should have spoken up about the ranch dressing, but I was kind of amused by it and I figure on a molecular level it's about the same as tartar sauce. the music varies and is the bar tenders choice. a strange thing about pricing is that half pints are cheaper(re SPE) - where pints are $5.75 half pints are $2.75 - I love that. HI- the music differs greatly, last Tuesday I was slamming busy and felt so uplifted when I realised Judas Priest was on there ;) Sometimes its 80's, sometimes Album rock (one of my faves, as it is mostly B-sides) Don loved the 50s 60s 70s and you wil still hear a lot of that. Beer and cost/price: PLEASE tell us if you find a discrepancy! It is so embarrassing when that happens, it would be a big help if you would say something. It is hard to keep up with the prices, and while I SHOULD look every time I ring something in, well...it's a problem. Same goes for the tartar...SAY something so we can FIX it! Half pints are "usually" Half the price of a full pint plus a quarter. They could take Brouwer's lead and play death metal at an ear splitting volume, as they were the last two times I was there. I enjoyed it, but it didn't seem too popular with many others. Hi Yubet: Thanks for the corrections! Don't know why the music struck me this time and never before. I wasn't going to haggle over 50 cents on a pint of Boneyard RPM, especially when I was so happy to see the prices listed in the first place. That's a good move.